As most viruses these days arrive by email, Mailtraq can play an important role in protecting the organization. Mailtraq enables you to use a number of different technologies to achieve this - you are not locked in to one particular approach or anti-virus vendor. Mailtraq integrates with the free ClamAV antivirus system as well as the leading antivirus software for mail servers. The anti-virus interface is integrated to the Mailtraq Console under the Options menu. Do not use 'end-point' editions of anti-virus software. Mail servers have different requirements for anti-virus than ordinary desktop boxes or file servers. 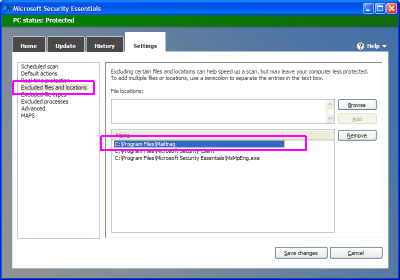 (see KB article for installation and configuration information). Licensing for Commercial anti-virus software integration has become expensive, and the sophistication of modern anti-virus software is very processor intensive, slowing server performance. For these reasons, for business installations the best practice is to use a perimeter Gateway anti-virus appliance, either a software appliance on another machine or a hardware device. This provides the best value for money. Support for these products is provided by the respective suppliers. If you have installed Mailtraq's \database folder to a custom location, that also must be excluded from scan. Multi-threaded email servers have particular anti-virus requirements. This usually means that standard 'desktop' or corporate file-server, or End-point anti-virus software is not suitable. Errors in processing email can occur resulting in misdirected messages or even database corruption. Regular desk-top anti-virus programs are, of course, fine to use on your client machines. Mailtraq 2.5 (and older) users: Although the new and old systems can be run together, the MessageFilter API (used by the AVG plug-in) makes the final decision on what action to take. We recommend that you uninstall the previous plug-in. * Current versions of Mailtraq use a custom Temp folder within the \database folder.